The machine is suitable for steel, stainless steel, galvanized sheet, aluminum, cardboard, other non-ferrous materials and plastics etc. The shape can be designed according to the clients’ request. Ⅰ. The material thickness is from 1.0 to 10mm. 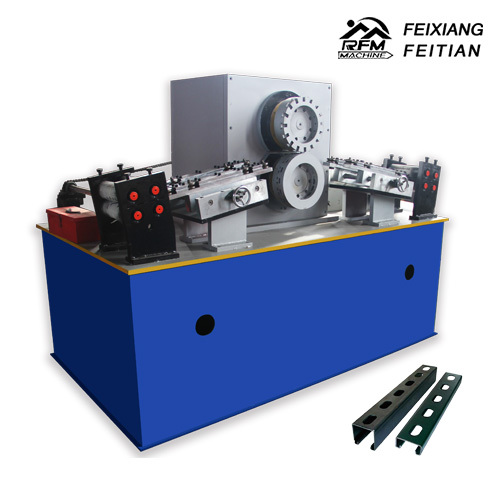 The machine can be used in Building materials industry, such as photovoltaic supporter, cable tray, storage rock etc. Ⅱ. The material thickness is from 0.3 to 1.0mm. The machine is mainly used in interior decoration industry: hanging ceiling suspension, angle steel and other fields. Ⅲ. The material thickness is from 0.02 to 5.0mm. The machine is mainly adopted in plastics and printing industries. The rotary punching machine owns higher accuracy than the former two industries. (2) The company will provide technical support to the machine for the whole life. (3) Training: Our technicians are available for training overseas. The buyer should charge of visa, return ticket, food and accommodation overseas and USD100/person/day for salary.